Opposition leader Raila Odinga holds a bible aloft after swearing an oath during a mock "swearing-in" ceremony at Uhuru Park in downtown Nairobi, Kenya, Jan. 30, 2018. Kenya’s Interior Ministry has declared the opposition alliance known as the National Resistance Movement, or NRM, a criminal organization after the group’s leader, Raila Odinga, in front of thousands of supporters, symbolically took the oath of “president” in defiance of last year’s controversial election and of authorities who said his actions would be considered treason. Supporters of opposition leader Raila Odinga, one wearing a mask, attend a mock "swearing-in" ceremony at Uhuru Park in downtown Nairobi, Kenya, Jan. 30, 2018. The Interior Ministry wasted no time issuing a statement after the ceremony declaring the NRM an “organized criminal group” under Kenya’s Prevention of Organized Crimes Act. It was not immediately clear if that would mean the arrest of Odinga or any other opposition leaders in the NRM. Citizen TV was one of three major stations to go off air Tuesday. Citizen TV's owner expressed shock and disappointment to VOA that it could happen with no explanation. 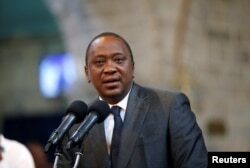 President Uhuru Kenyatta was declared the winner of an August election, but the country’s Supreme Court took the rare step of annulling the results, citing irregularities within the electoral process. Odinga boycotted an October re-run of the election and the court backed Kenyatta’s win in that vote. Odinga’s National Super Alliance, or NASA — a coalition of opposition parties — contests the results of the re-run vote. Kenya’s attorney general in December said Odinga declaring himself president would be considered an act of high treason, an offense punishable by death. President Kenyatta’s office last week warned Odinga that any actions would be subject to Kenyan law. Although police used some tear gas on supporters in an area near the event, an expected heavy police presence did not materialize and no major clashes occurred. Opposition concerns their leaders could be arrested before the event did not come to pass either. 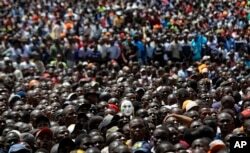 Odinga briefly led the packed crowd in a chant, repeating, “A people united can never be defeated,” before telling supporters that Tuesday’s speech was for the media and “the rest would all be known to you in due course.” His entourage then slowly drove through the crowd and out of the park. 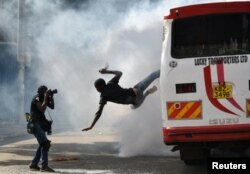 A supporter of Kenyan opposition leader Raila Odinga of the National Super Alliance (NASA) coalition jumps from a bus after riot police fired tear gas canisters to disperse them after his swearing-in ceremony in Nairobi, Jan. 30, 2018. Although there is no legal backing for Odinga’s “inauguration,” many supporters like Peter Musyoka are optimistic. “After the swearing in, I am expecting our president ... to lead us and give us a way forward. And, I believe that Kenya will completely change, our democracy will change, and Kenyans will fully understand their rights,” he added. In an exclusive interview with VOA's Swahili service earlier in January, Odinga raised the possibility of forming a rival government, either inside or outside of Kenya. VOA Swahili contributed to this report​.